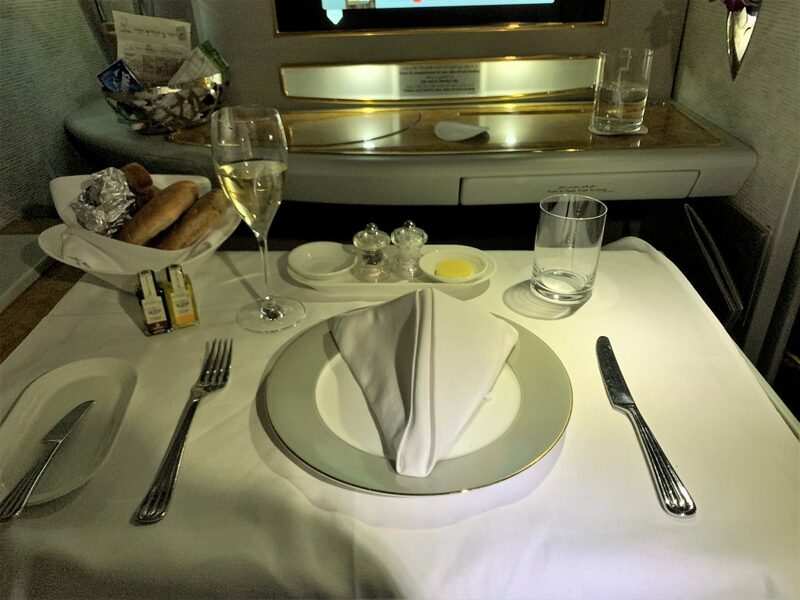 This is the first in a series of reviews of Emirates First and business class flights. 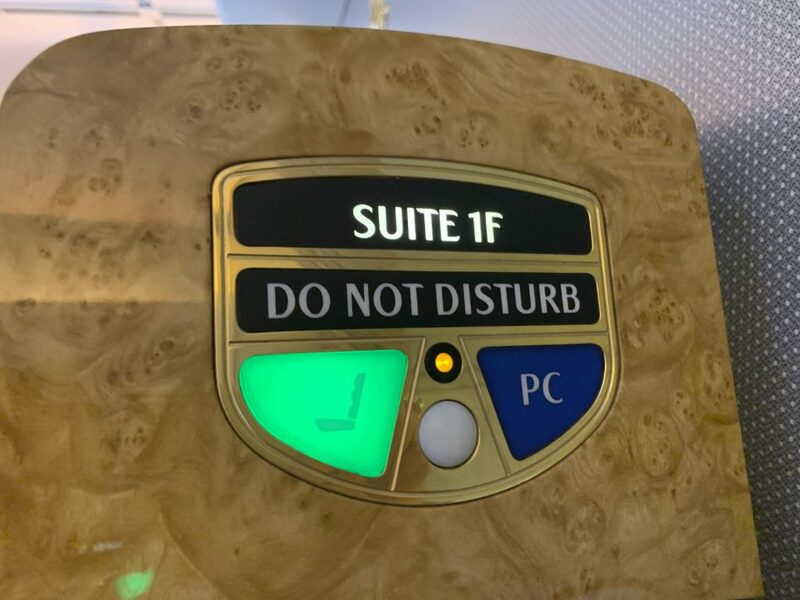 This flight was in the old First Class cabins but we also tried the new B777 cabin on the same trip which I will review later. 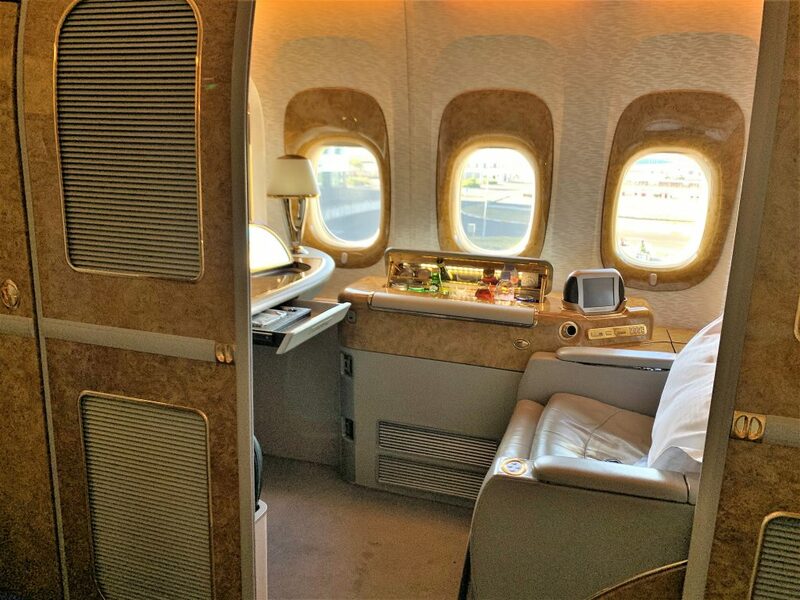 Unbelievably this was the first time that I had flown Emirates. 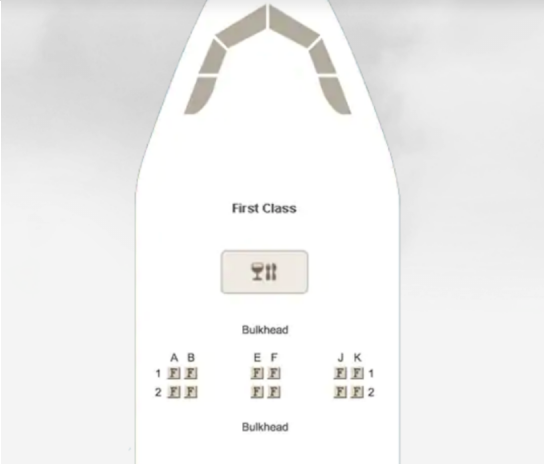 I had always been put off their business class by the inconsistency of their seating from 1-2-1 arrangements to 2-3-2. Pricing for Emirates also tends to be pretty high. However flying Emirates First had been on my aviation bucket list for a while. 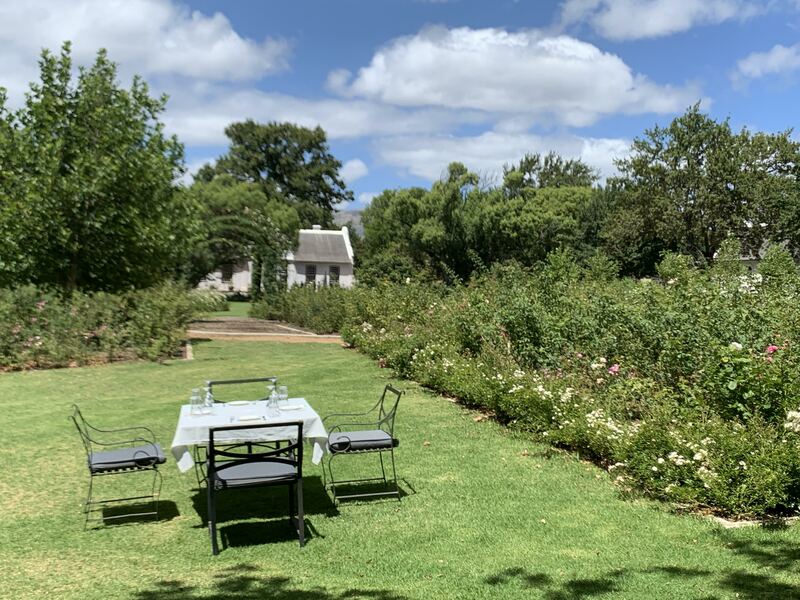 When a great fare came up that Roving Reporter had managed to snag very nicely for his upcoming Cape Town trip, it didn’t take much to persuade me to join him! This was a rather strange fare as it originated in Cape Town or Johannesburg to London Stanstead (which has the new first cabin). The return was in economy from Istanbul. This gave a very reasonable fare of around £1550. I positioned out to Johannesburg using Virgin Atlantic miles and then flew with British Airways (Comair) down to Cape Town. The trip did not get off to a good start as the chauffeur was late. There was no way of contacting the office as it was closed at weekends so I was beginning to get a little worried. Fortunately, he turned up after about 20 minutes and apologised. He had gone to a similarly named place as he hadn’t looked at the address, only the name of the guest house. The car was a BMW 3 series and nice enough. Check-in at Cape Town was pretty unremarkable, which is understandable for a small outstation. There was a separate First queue but that was as far as the VIP treatment went – no red carpets here! The check-in agent was friendly and explained where the lounge was. 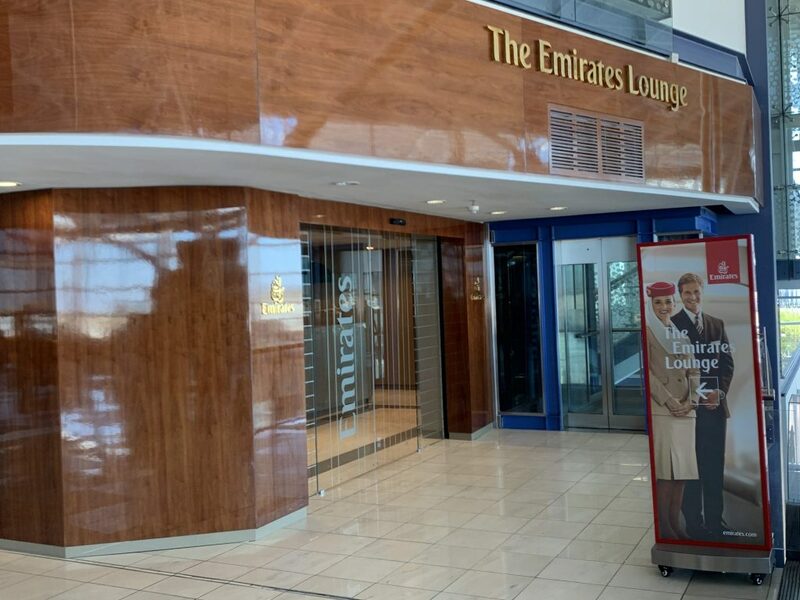 There is a dedicated combined First and Business class Emirates lounge at Cape Town. 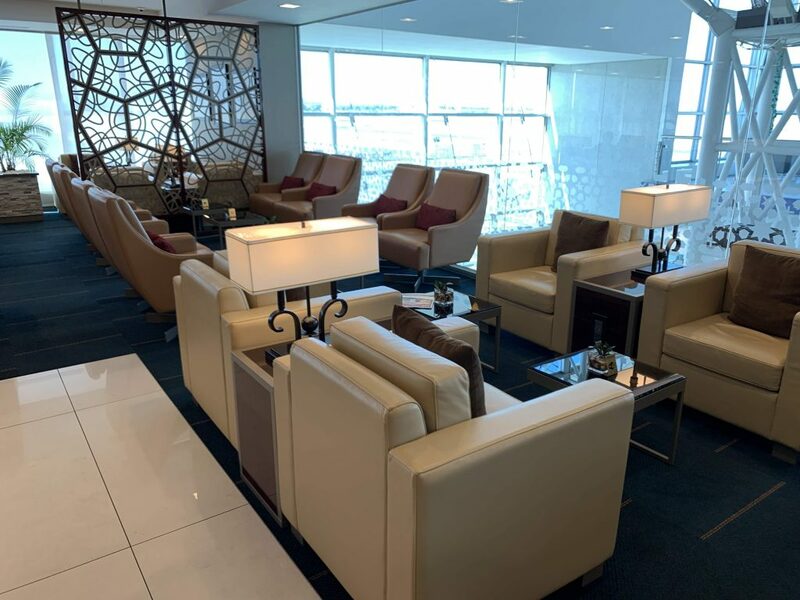 The staff here were very friendly when I arrived and took the time to explain where everything was and how the lounge worked. Downstairs was the main seating area which had help-yourself alcohol and soft drinks. There was also a small work area with some PCs plus showers. The bathroom was a bit odd as there was only one female toilet which seemed a bit odd for a large lounge area. 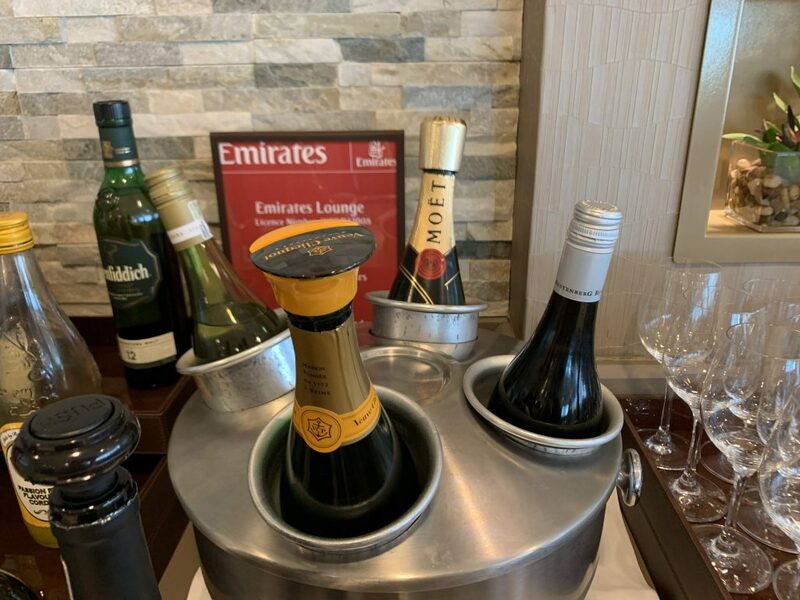 The decor felt quite dated but it is the standard Emirates lounge decor that you find everywhere. More importantly, though there was a decent selection of alcohol including two champagnes – Veuve Cliquot and Moet. There were also high-quality wines and the usual choice of spirits. RR and I decided to try a glass of the Veuve Cliquot Champagne. It’s funny as this has been a favourite of ours in the past but neither of us had drunk it for ages. Both of us were left wondering why we had liked it so much – was it the lounge champagne maybe? Having tried it since I can say that either Verve has got worse or our tastes have got more expensive! After the fizz, I ventured upstairs to look at the food. 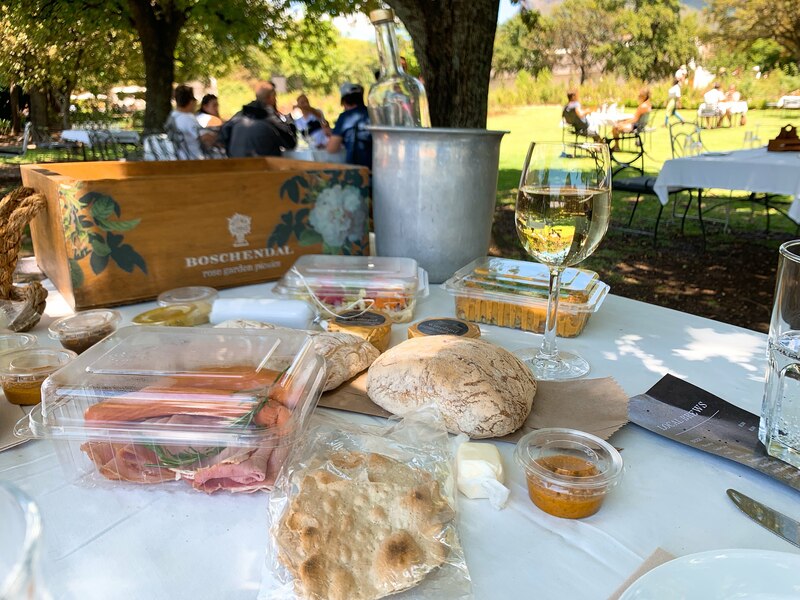 Having had a lovely picnic at Boschendal vineyard (which I recommend) and planning to eat onboard, we didn’t try any of the food. It did look very impressive though with a wide selection of hot and cold. 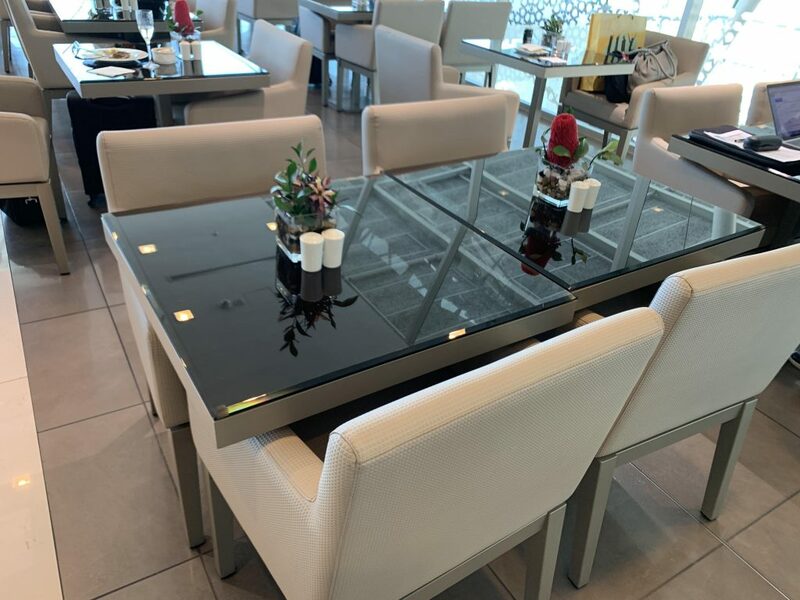 The dining area was light and airy and felt premium rather than canteen like which some lounges do. Boarding started with First class. Roving Reporter was getting the flight after me and he had quite a different experience. I will add in his comments as I go along. At the door, I was greeted by the crew and shown to my seat. I had chosen a window seat 1 K as there was little to choose between them on a day flight. Unfortunately, at the gate I got the non-magic beep and was told my seat was inoperable and I had been moved to a middle seat – 1F which was not the best start. I was keen to see the views on take off so I asked the crew if it was possible to sit there just for take off. There ensued a load of confusion with the crew telling me the seat was working even after they apparently checked. After I had moved back to the window seat the purser appeared and said that the footrest wasn’t working if I wanted to go back to 1F. It was like a game of musical chairs! I was slightly concerned that the didn’t seem to know whether there was something wrong or not. One of the things I like about Emirates is that you can look at a 3D display on their website and app of the seats. It is pretty realistic and gives you a good idea if you are choosing a decent seat or not. Once in my seat, I sat for quite a while without being acknowledged. Eventually, one of the crew came up and introduced herself as the one that would be looking after me. She was not exactly what I would call friendly and her manner was quite brusque. There was no offer to show me how the seat worked and no offer of a welcome drink despite the fact that I could see everyone else had one. As she turned and walked away I decided to be direct and ask for a glass of champagne which was brought fairly quickly. 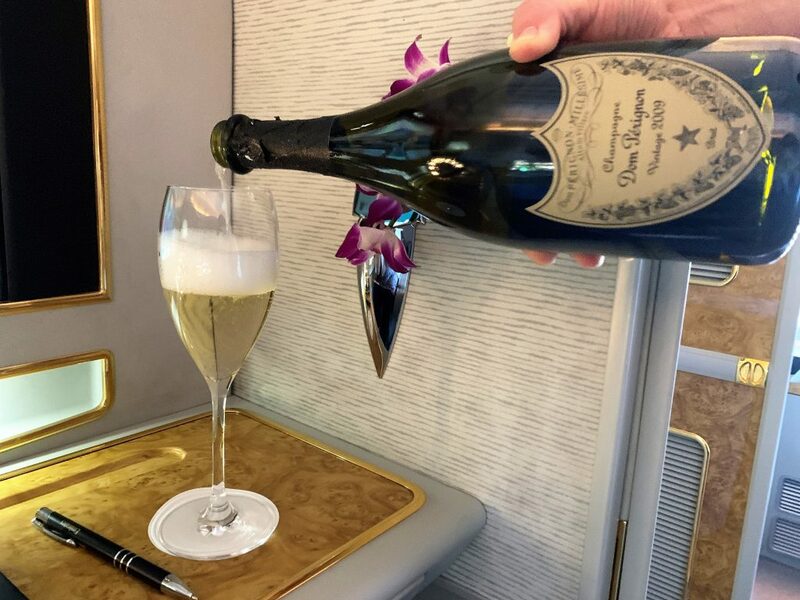 She presented the bottle of Dom Perignon 2009 (retails at about £130) and poured me a glass. Newspapers, magazines, Arabic coffee and dates were also all offered before take off. 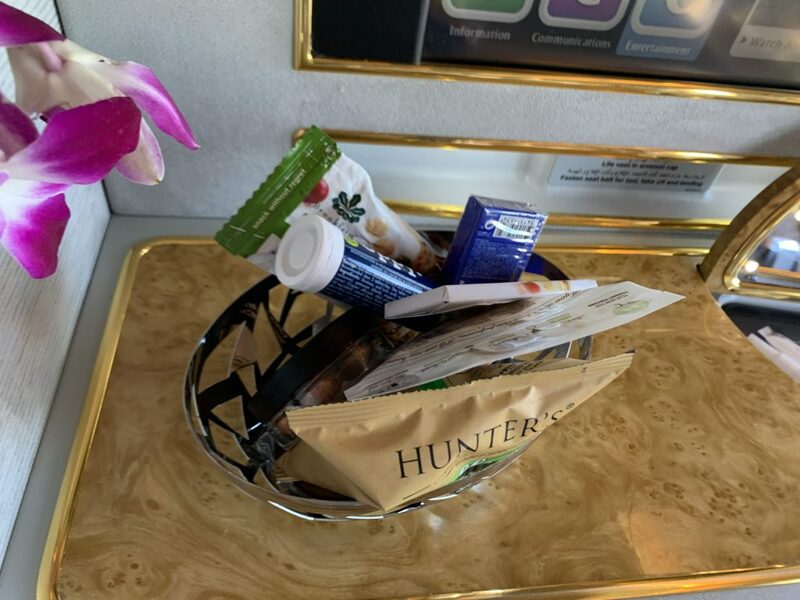 At the seat, there was already a basket of snacks such as salted caramel chocolates, Smints and some special flying version of a rehydration/vitamin type fizzy tablet. This was removed before take-off and then brought back for the remainder of the flight. I am not generally a fan of the amenity kits that are based around a fragrance as if you don’t like the scent then you will not want to smother yourself in it. The drawstring bag contained a bottle of perfume. 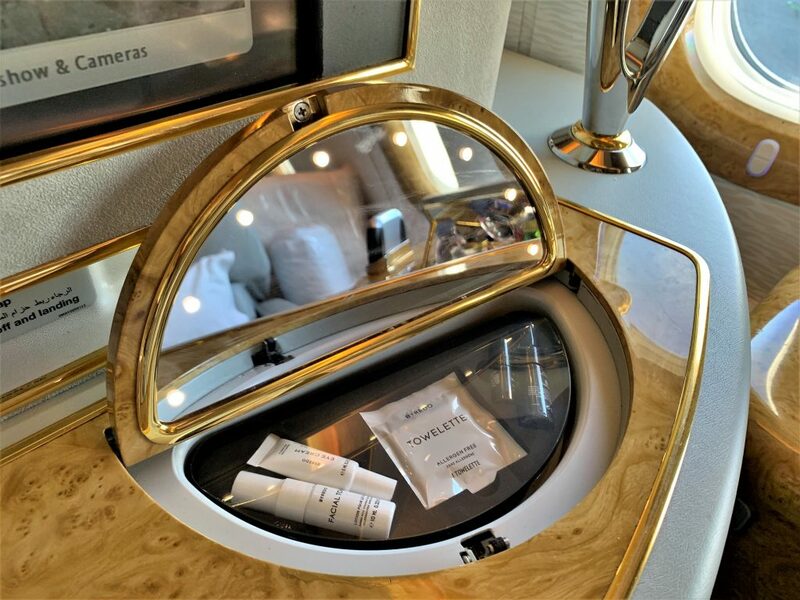 Fortunately, Emirates also provide a very nice Byredo skin care kit which is in the vanity area rather than in a kit. These are very high-quality products and I did love the smell of the pillow spray through which I am still using at home and on my travels. 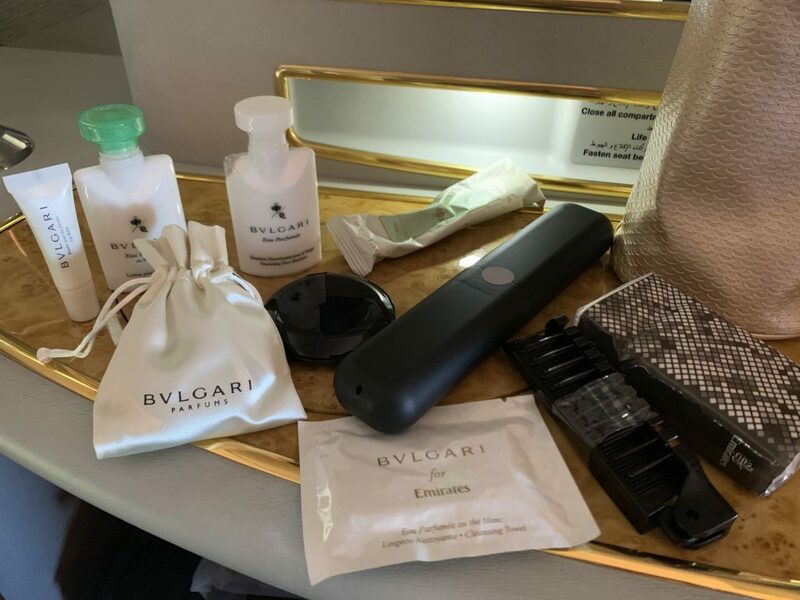 It seems odd that you only get the amenity kit on night flights although there were toothbrush and toothpaste in the toilets as well as mini tubes of Voya hand cream. The items I loved the most were the leather notebook and pen in the drawer. 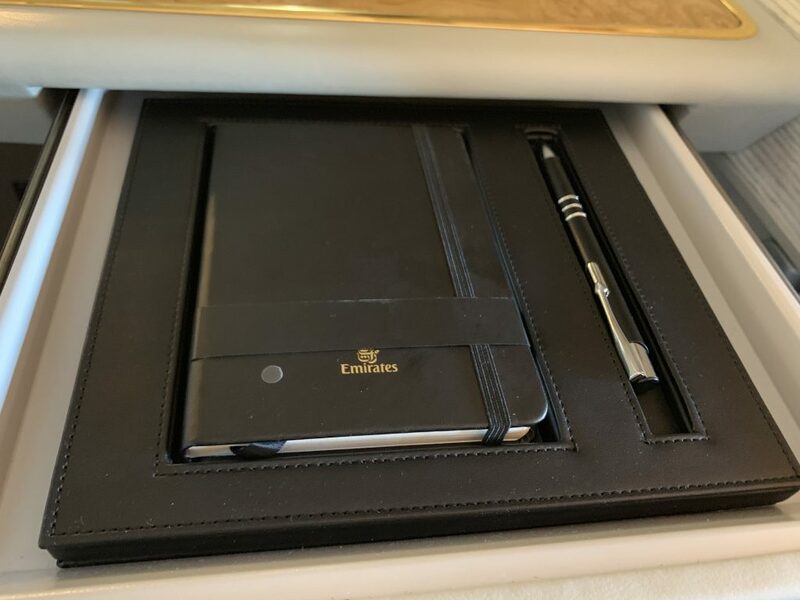 These were a lovely memento to keep, and the pen was excellent quality for writing notes. (look out for some in the next TLFL giveaway). I had chosen 1K/F as there really wasn’t much to chose between the seats. 2F/K may have been slightly quieter being further away from the galley, but I didn’t really hear much from the crew. My first impression was – ‘Blingtastic’. The suite is as over the top in person as it looks in pictures. You can’t fault the wow factor though! I’m actually not that bothered by the bling – for me the comfort, food, drink and service as far more important. I did rather like the mini bar which rose up and down at the touch of a button (very James Bond!). 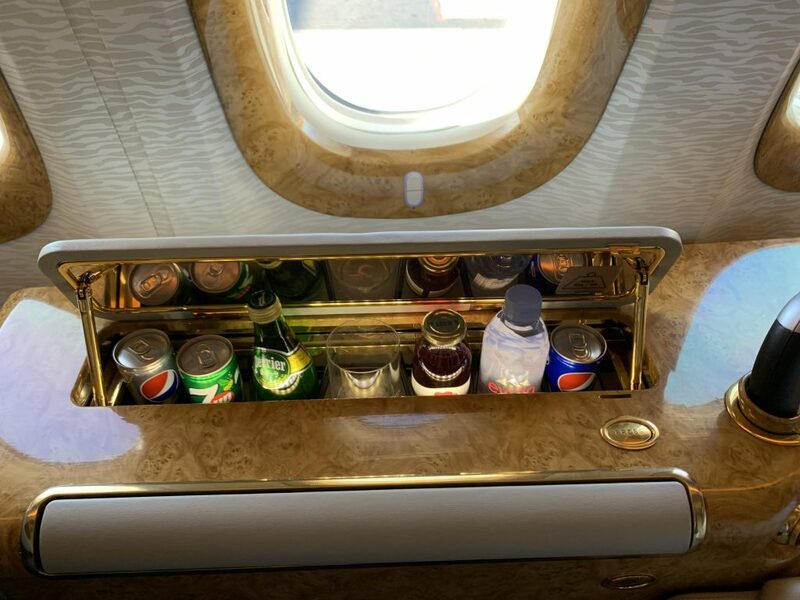 Yes, the drinks aren’t chilled, but it is handy being able to just grab a bottle of water when you want. The vanity area mirror was useful with the lighting when I woke up in the morning and wanted to ensure I wasn’t going to scare small children before I went to the loo! There was strangely not really a specific space for hand luggage as you put it under the main shelf. I wasn’t totally convinced on the safety of this even though there was a seat belt o strap in any large carry-ons. I did enjoy not having to lift my stuff into an overhead bin though and it also kept the noise down in the cabin. The seat was comfortable although a little hard to control. There were several ways to control it including preset positions. 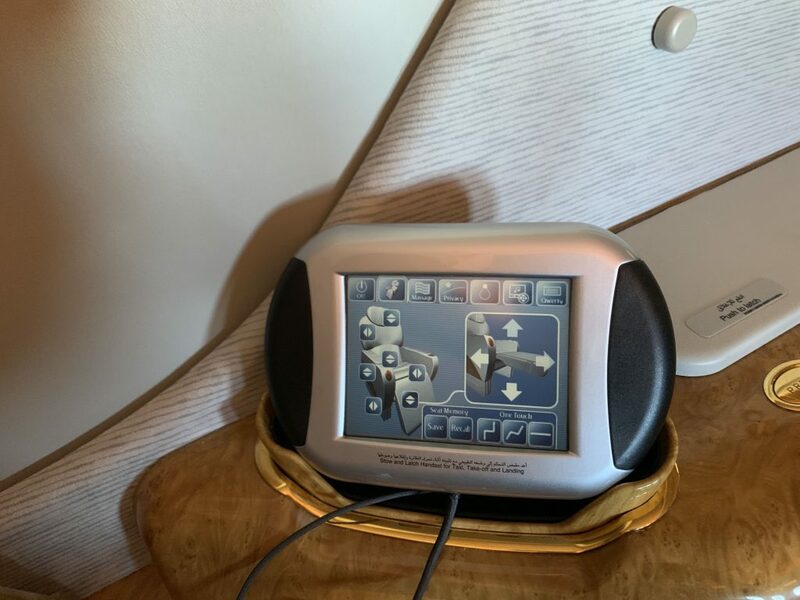 The tablet type controller was somewhat temperamental, and the seat would continue moving long after you had gently pressed the button. Eventually, I managed to get it into a good position. It was certainly a very adjustable seat with many different areas you could control. 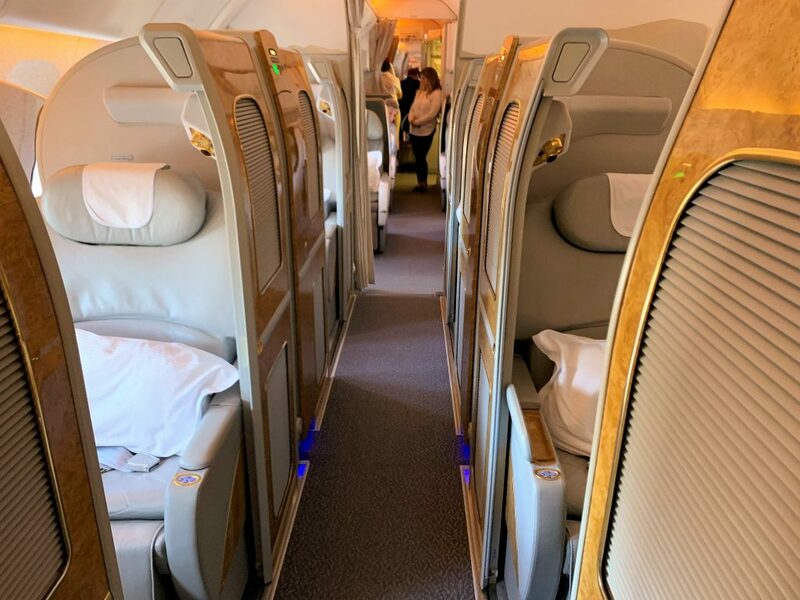 The seats are arranged in 1-2-1, and the middle seats have a large divider which when put up makes a very private cabin if you are travelling solo. Other than the lack of view I was quite happy with my seat. There was a do not disturb sign to illuminate on your suite which was useful. 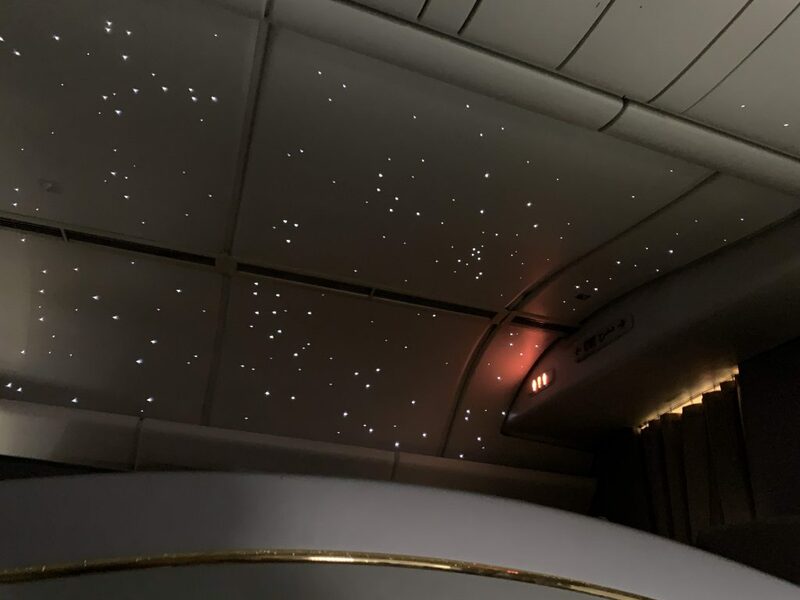 Both RR and I loved the twinkling ceiling lights that were like stars. We both found the placement of drinks on the front shelf strange as it was very difficult to reach and seemed odd given that there was a shelf next to you for drinks. I can only assume it was to stop the crew from having to lean over you. This strategy was a highlight for me. Continuing on the theme of the somewhat half-hearted service there was no offer to make up the bed. 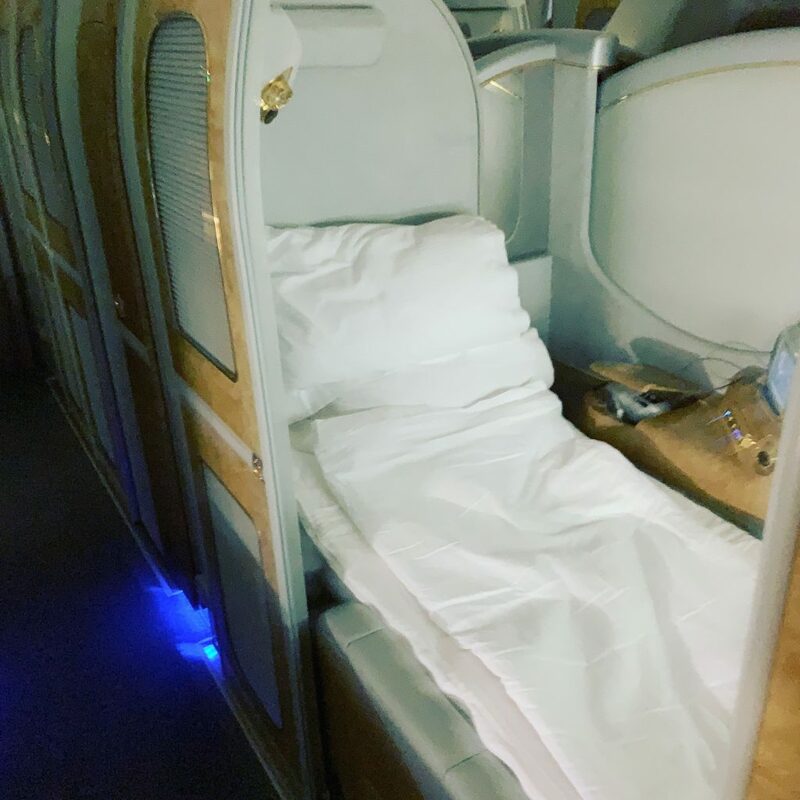 This is especially strange given that it was a night flight and having just flown Emirates in business class they offered to make the bed up for me on both flights. Fortunately, it was straightforward. I have to say that hands down this is the most comfortable seat EVER for sleeping. I actually think it may have been better than the new seat by a tiny margin. The mattress topper is about an inch thick of memory foam and combined with a large fluffy pillow and crisp white cotton covered duvet I slept until 40 minutes before landing. Having the doors shut also meant plenty of privacy even if they weren’t full height like the new first. With only two rows of seats, there was little foot traffic in the cabin. The full menu is dine on demand but I had decided to eat straight away as I wanted to try and get some sleep. 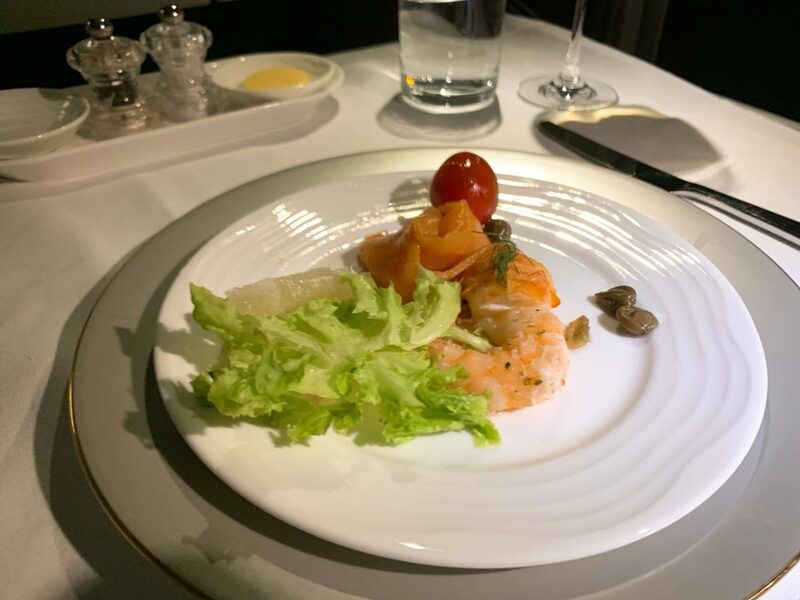 The cabin crew serving me came to take my order in a somewhat unusual and what I thought rather a rude way – she gestured at the menu and said ‘you want something?’ I wasn’t quite sure I had heard her correctly, so I had to ask her to repeat it! I was also offered a drink to start, so I decided to stick with another glass of the champagne. I am a big Krug fan and despite this being vintage I still prefer the normal Krug although I did enjoy it anyway. The drinks and wine list were highly impressive and had a lot of very premium and expensive items. The champagne was brought with some warm nuts followed by some canapes (you may need to request these from the menu). RR went for a Negroni and found it rather on the strong side! My table was laid up in full restaurant style and a basket of bread with butter, olive oil and balsamic presented. They also came round with additional bread choices including my favourite garlic bread. 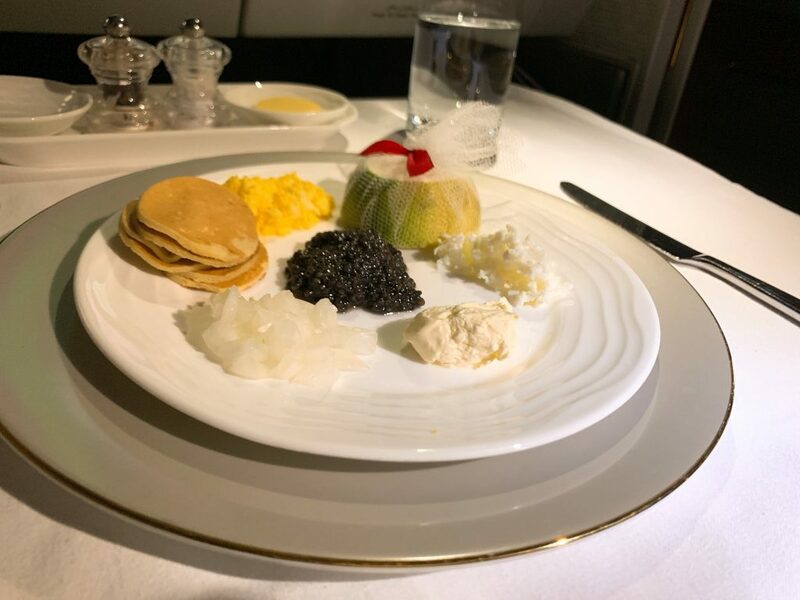 Of course, I had to go with the caviar to start. It was good caviar with all the trimming although the chunks of onion were huge and way too big to serve with caviar. Still, that is very much a first world problem when you are sipping vintage champagne and eating caviar! Next, I went for the seafood trio which was also a starter. Wine was not offered or top ups so I just asked for everything as I needed it and rang the call bell if I had to. The seafood was tiny and a bit disappointing as it was literally just plain seafood with no sauce which made it a bit dull. The seafood was all perfectly cooked though. I tried a couple of the white wines and particularly loved the Ken Forrester Chenin Blanc. 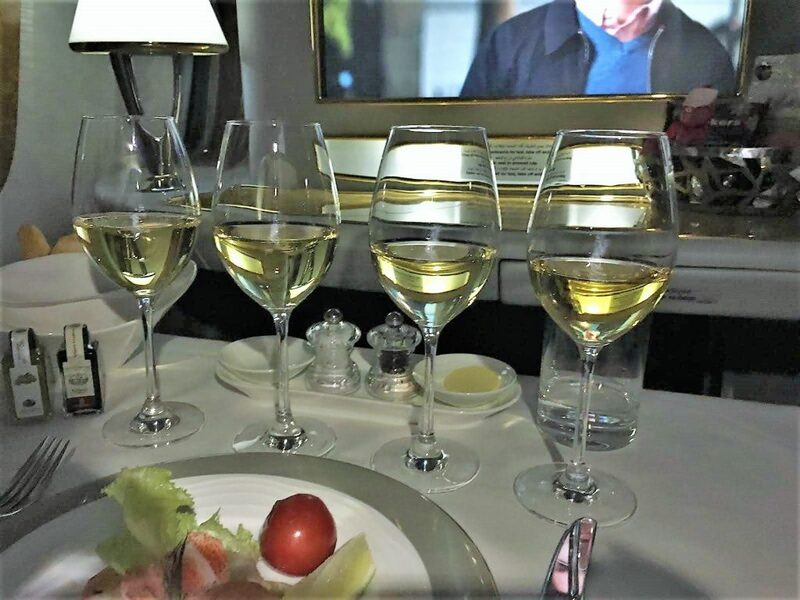 RR was provided with a wine flight, and his crew took the trouble to explain that the top two wines on the list were exclusive to first while the others were also served in business class. He thought his crew were very much there for whatever he needed at any point in the flight. I did not get the same impression except when the Purser was around. I found the main course choice a little underwhelming so I thought I would try something different and went for the ostrich. I was slightly wary as ostrich really needs to be fairly rare to stop it being tough. 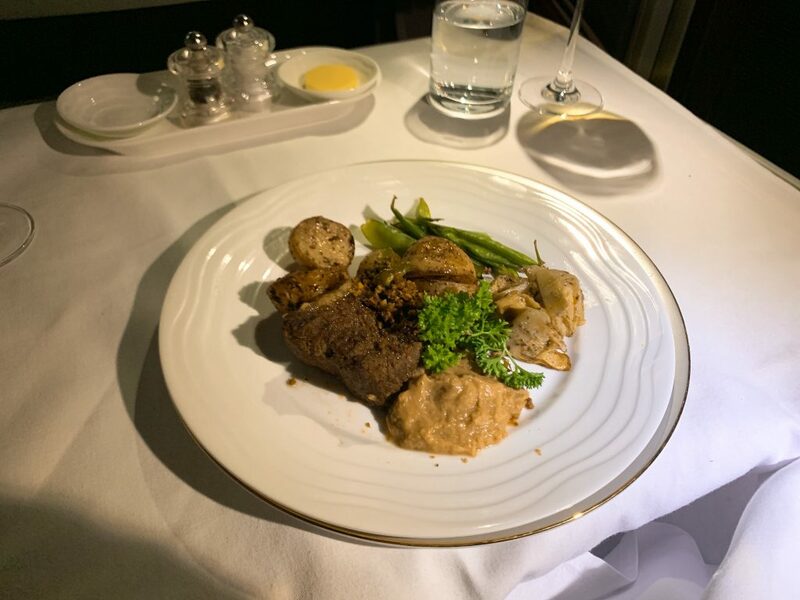 Even though it was slightly overdone it was still very tender and the spicing on the dish was immaculate – it was an incredibly tasty dish and well worthy of a restaurant table. Despite bursting at the seams by now, I had to try the cheese which was good quality but I would have liked a chutney with it and some more exciting crackers. 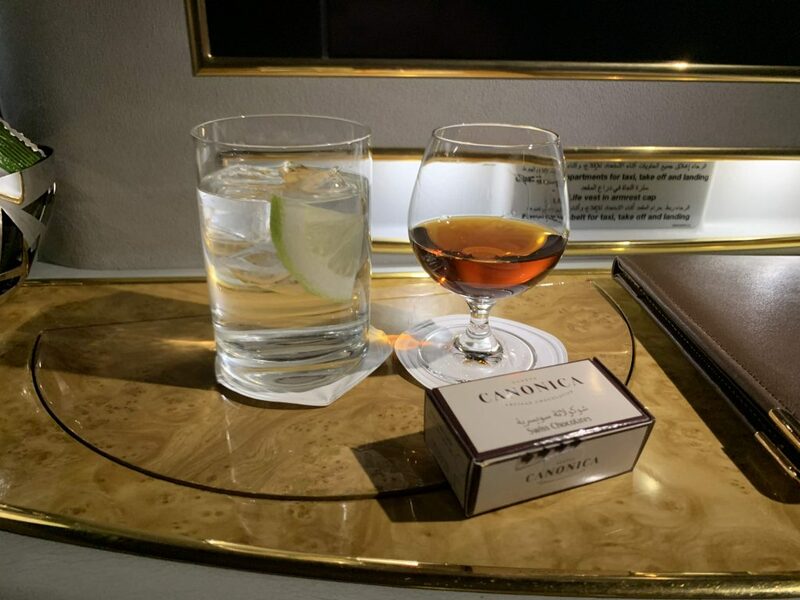 I finished with a glass of cognac which even RR tried on his flight despite not being a cognac lover. Hennessy Paradis is a stunning cognac that retails at around £500 a bottle. I can honestly say I savoured every drop of it! It was presented with a box of two chocolates which was a nice touch. I didn’t bother with breakfast as I woke so late although I was very surprised that when I woke up and even stood in the galley that none of the crew acknowledged me or offered me anything. 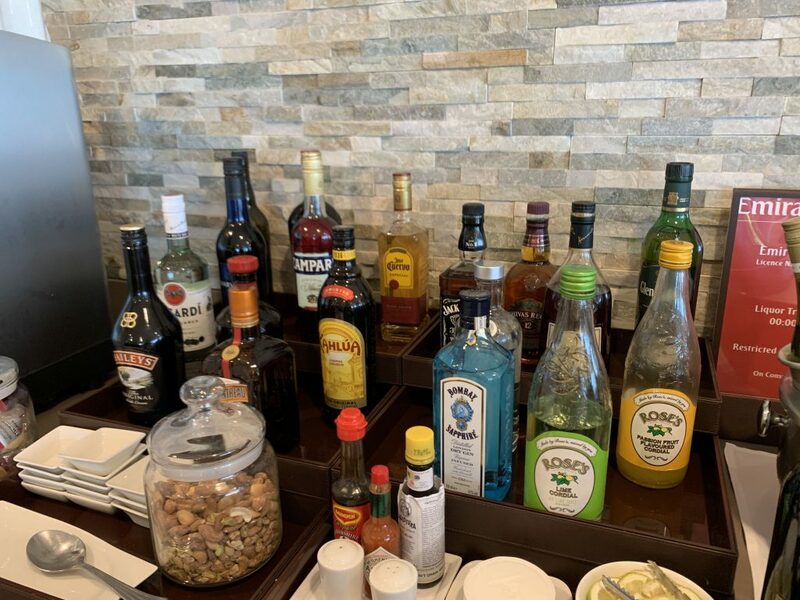 On most airlines even in business class, I would have been offered a drink if nothing else before landing. Again I think this was just an unfortunately bad crew. RR had an omelette which was tasty if a little rubbery. Other than the purser who was very friendly and popped by a couple of times, I found the rest of the crew miserable, uninterested and unfriendly. I did try to see if they would warm up if I was super charming and tried to chat with them a bit but it didn’t work either, so I gave up at that point! 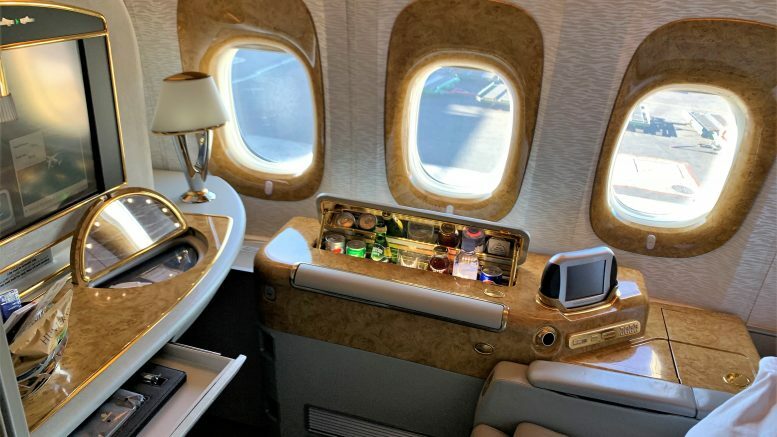 Emirates have wi-fi on board, but they are not great at informing you about this as RR didn’t even realise he had wi-fi on board let alone that it was free. 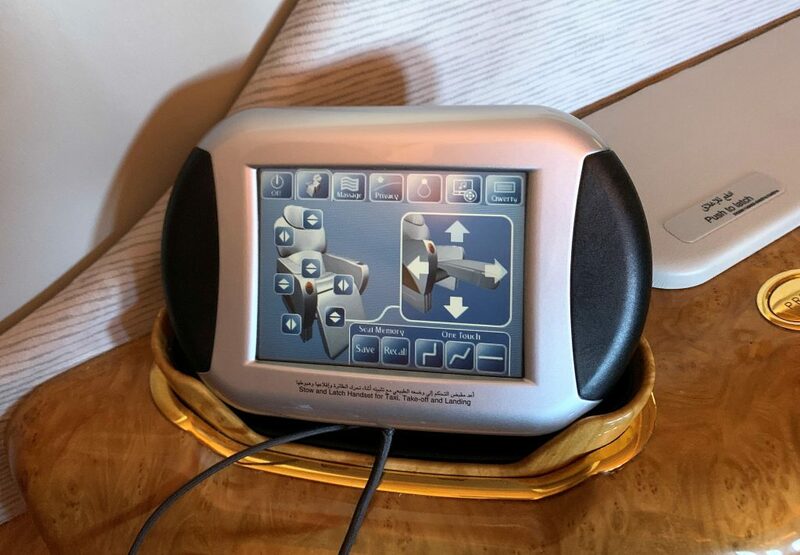 Wi-Fi is free in first and business class if you are an Emirates Skywards member. Make sure you join before you board and can remember your password as you will need to sign in. I found the wi-fi OK speed wise although it was quite slow to download pictures from what’s app etc. For free though I couldn’t really complain. You can also use your phone on board, and unfortunately, this meant voice calls. It wasn’t so bad on this flight, but on the next flight, I could hear people shouting into their phones for much of the flight. I really wish airlines wouldn’t allow this. RR’s controller failed and had to be reset four times although it did work eventually. If you wanted to charge your devices, there were plenty of options with a multi-country socket, USB port and even an HDMI port if you wanted to play your own content. I still haven’t got round to trying this, but I will report back on my next flight as I have my cable ready to go! 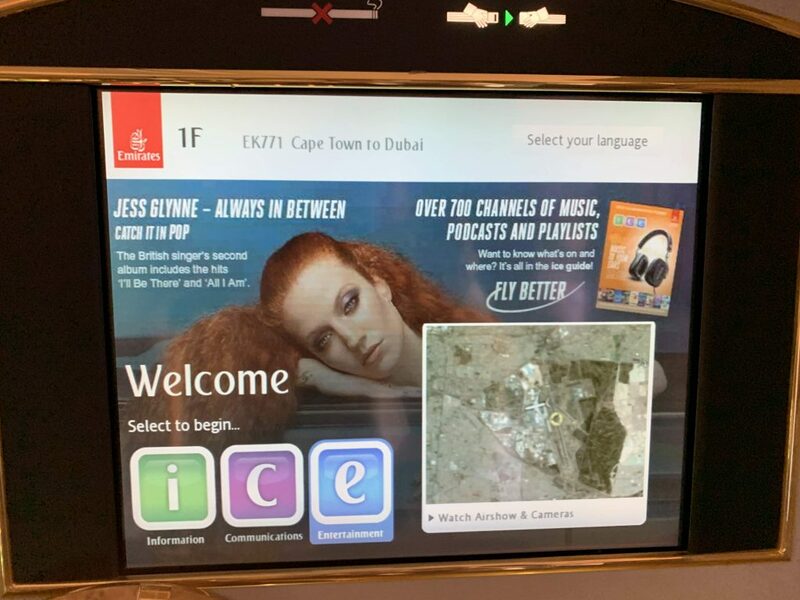 Emirates ICE system is very impressive, and regarding content, I think the best that I have experienced. There was an overwhelming choice of material and I didn’t really know where to start. Funnily enough both RR and I settled on a rather charming tale called Patrick about a non-dog lover whose life is transformed when she is left a pug in a relative’s will. If you are a dog lover, you must see this film. So many of the parts of the film showing coming home to a sheepish dog and a scene of destruction rang a bell! I wasn’t keen on the tablet controller as it was a bit fiddly to use, but there was also a more usual handheld remote which worked fine. 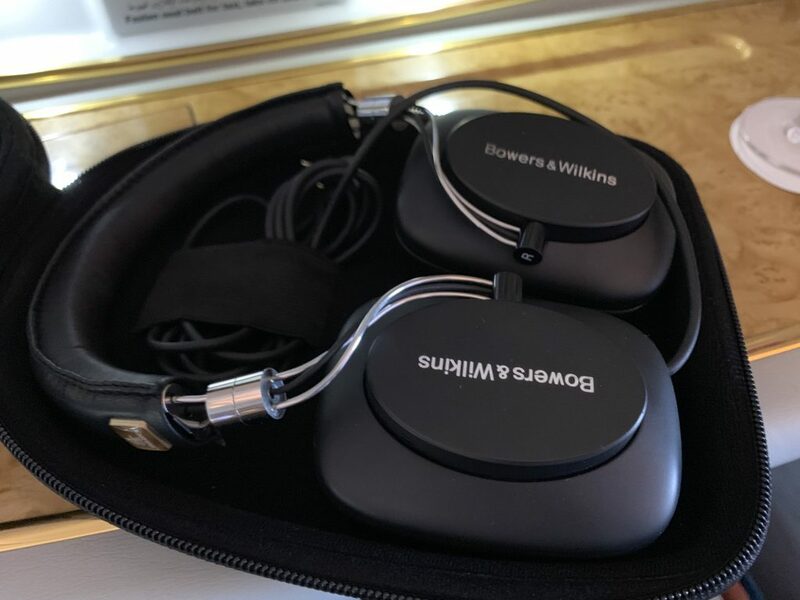 We were given the new Emirates headphones by Bowers and Wilkins in a nice case. Although they looked a bit old-fashioned I was impressed with the quality of these headphones. They were good enough to use for the entire flight both in terms of quality and comfort, so I didn’t even bother with my own Bose QC35 which is very unusual for me. Both RR and I had a remote stand, but a very fancy first bus was provided which softened the blow! 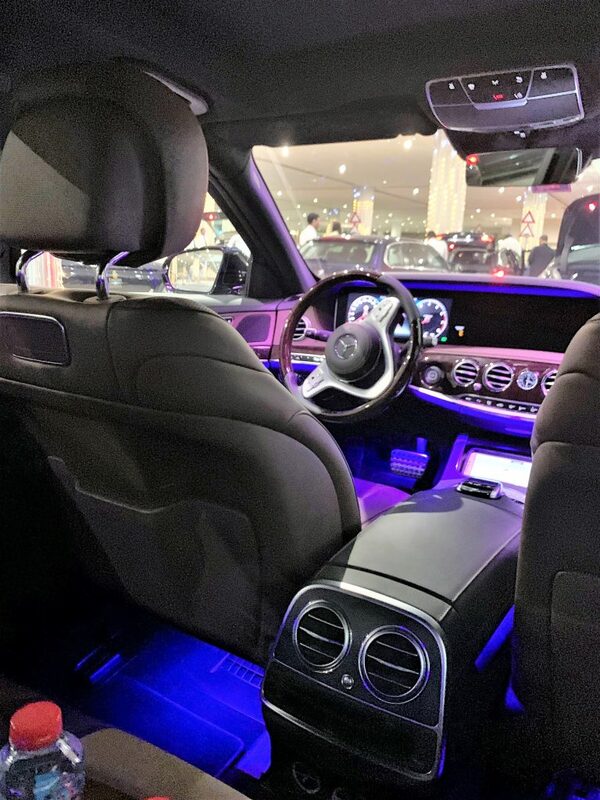 Chauffeur service is included within certain limits, but within the UAE I could travel to Abu Dhabi which is around 90 minutes from Dubai, so I got my money’s worth. The chauffeur service seemed somewhat chaotic for both RR and I. I was told there were no first cars available unless I wanted to wait, so I agreed to a business class car. 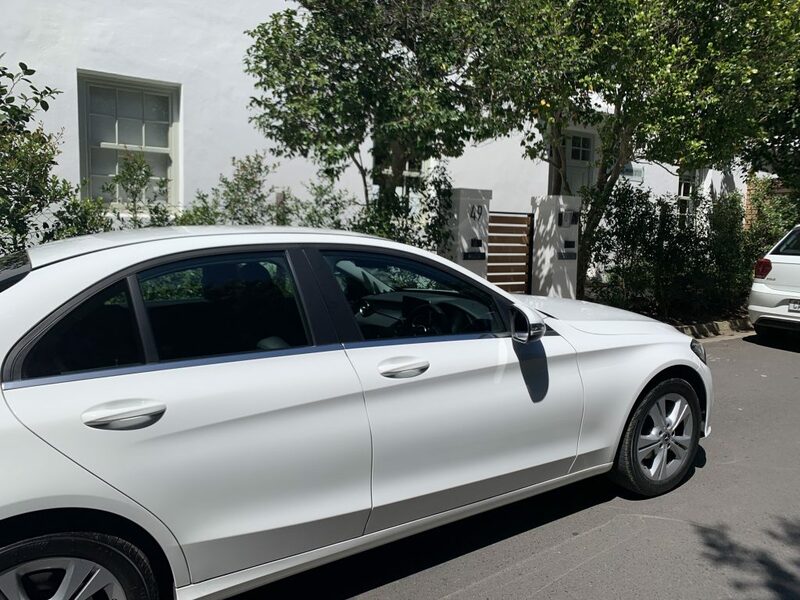 In fact, when I went outside to the chauffeur, I got an E class Mercedes First class chauffeur anyway. It was a comfortable way to travel. I was handed two bottles of chilled water on my way out of the chauffeur lounge. What I loved: Despite the unfriendly and sometimes inefficient service, I still enjoyed the flight. The seat was great even with all the bling and I loved all the little features like the vanity kit and mini bar. For sleeping, it was amazingly comfortable, and the entertainment system was top notch. In terms of wine and spirits, this was one of the best selections I have seen with very high-quality wines and champagnes. 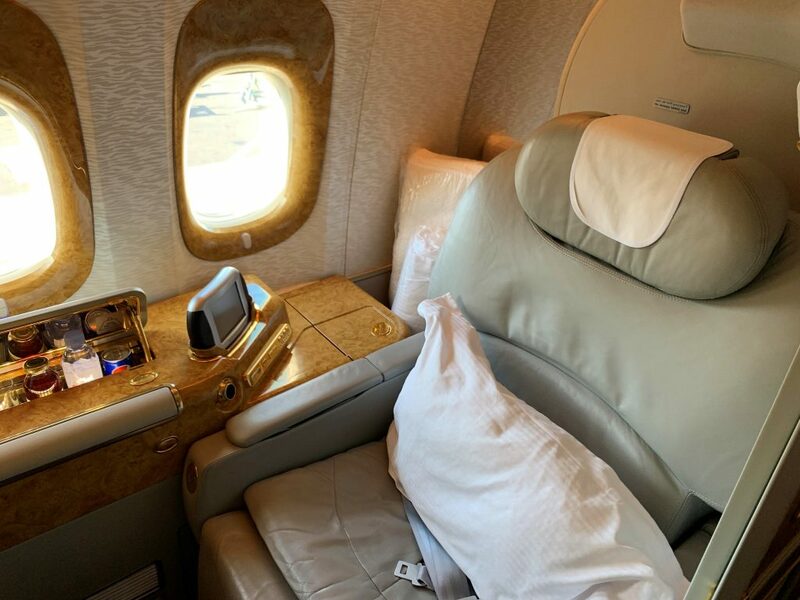 Not much really – if the service had been on par with all my other Emirates flights it would have been an amazing experience. I wasn’t keen on the tablet controller that felt clunky and a bit old fashioned now, but there were multiple ways to do most things so I could find different ways to do what I needed to do. The other niggles were incredibly minor – not liking the Bulgari fragrance and big chunks of onion is about all I can think of. Our Cabin Crew are trained to provide outstanding customer care at all times, it is disappointing to learn that you felt the service provided to you as a First Class passenger, fell below our standards. As part of our Cabin Crew’s extensive training program, 12 days of this course are dedicated solely on customer care and providing world-class service, which is where much of our success lies. 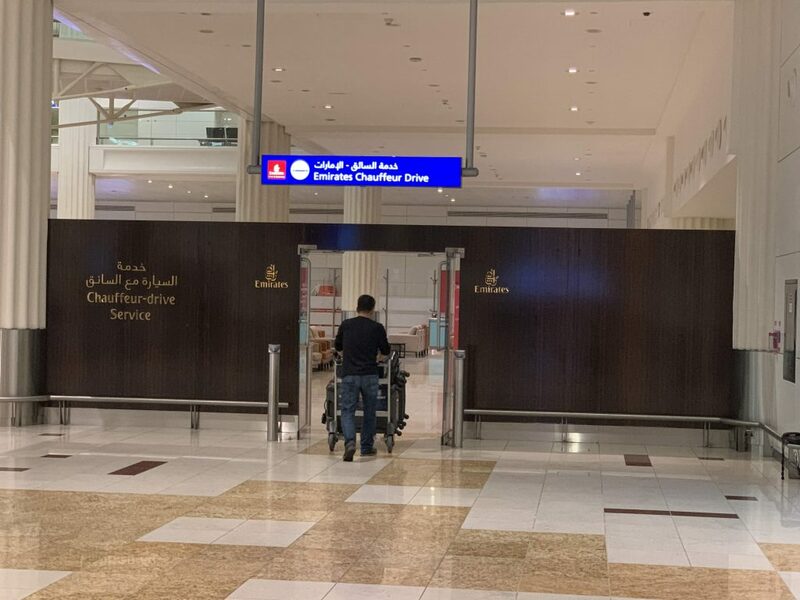 Our Cabin Crew represent and are the face Emirates, it is therefore very disheartening to learn of your experience on flight EK033. We are a service oriented organisation, and we take it seriously when our passengers do not experience the best that we have to offer. I would like to reiterate, that there is no excuse for rude or impolite behaviour, and assure you that the matter has been forwarded to the relevant Management for their internal review to be raised with the staff member in question, and in accordance with internal procedures, the appropriate remedial actions taken. 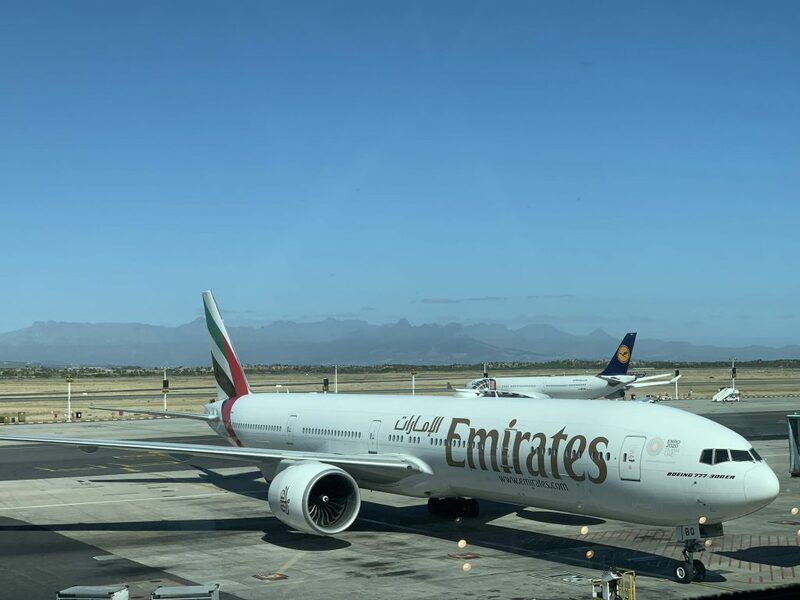 I have now flown four sectors with Emirates (2 first and two business class) in the last few weeks, and along with Roving Reporters flights, they have all had excellent service apart from the Cape Town one. This would lead me to be able to recommend Emirates as I do believe I was just unlucky. Even though many of love to moan about how inconsistent BA are, in my experience if you fly enough with any airline you will get the same issues. The TLFL team have had two bad flights with Qatar, and I have also had poor service on Etihad, Virgin and Oman Air. 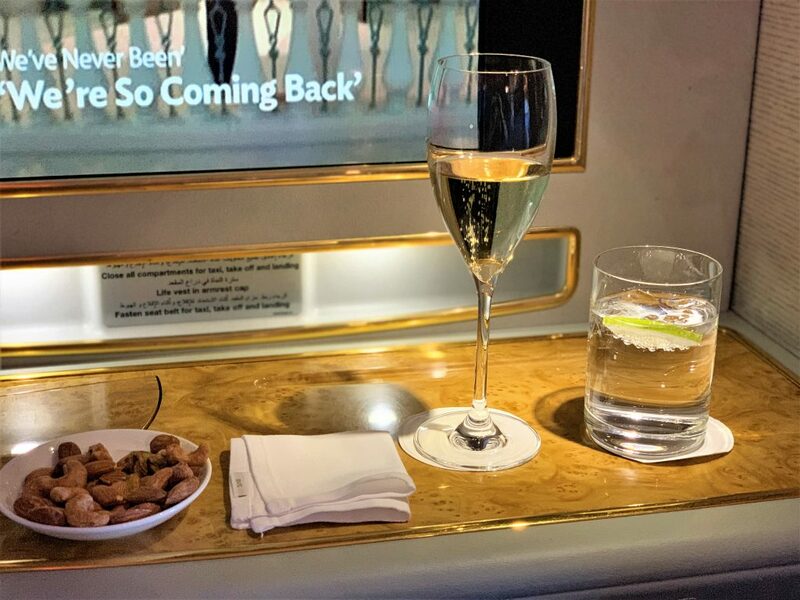 14 Comments on "Emirates B777-300ER First class review in 360°"
Thanks for a great report. 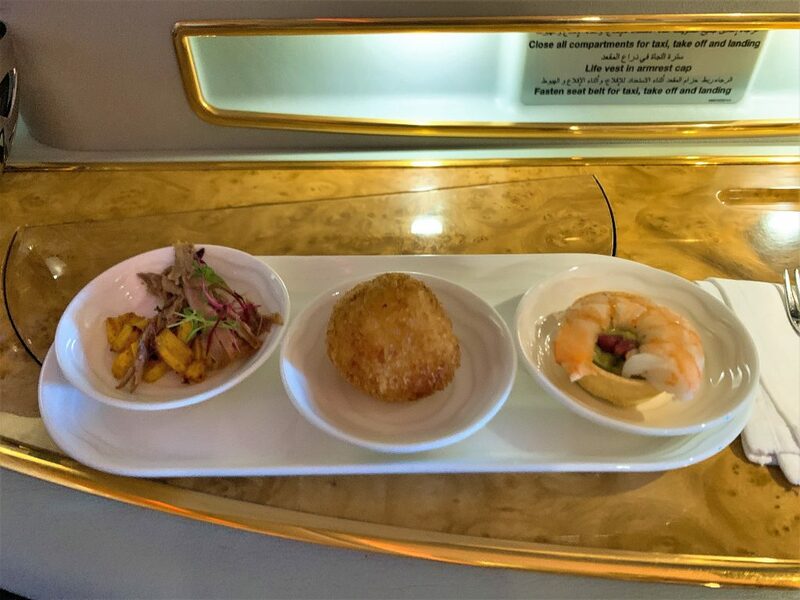 I have flown Emirates First on the B777 and had a very good experience with service. 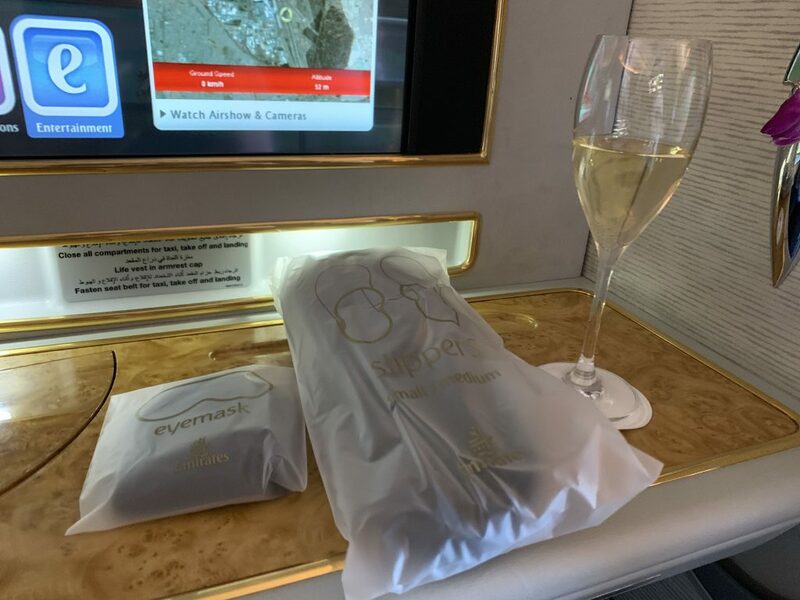 However, I LOVED Emirates First on the A380 (DXB/LHR) – the bathroom / shower was so roomy and it felt fantastic to have a shower at 30,000 ft!! Thanks Christine. I’m doing the A380 First this week and looking forward to that shower! Just out of curiosity, what was the more serious issue with the chauffeur? I would rather not say as it is a sensitive issue. I’m glad you said about the fact that you will come across inconsistencies in an offering the more you fly it. I like BA First, not totally for the service on the plane but for the whole experience. We mainly fly LHR to the US or Sydney and i would say that in 95% of our F flights end to end service has been impeccable. I still question why they do not have a foam mattress offering but that’s another issue. One point I would make is that I demand my family (kids) NEVER “expect” when we fly F long haul. Please and thank you at all opportunities and always be considerate where ever possible. On our recent Christmas trip in F to JFK the chief steward pulled me to one side at the end of the flight and said what a pleasure it was to have us onboard as a family, he explained more than just this but it’s best I leave that off here. So my point, we left our duty free onboard. While in the immigration queue we were found by the whole disembarking crew, who returned our duty free. 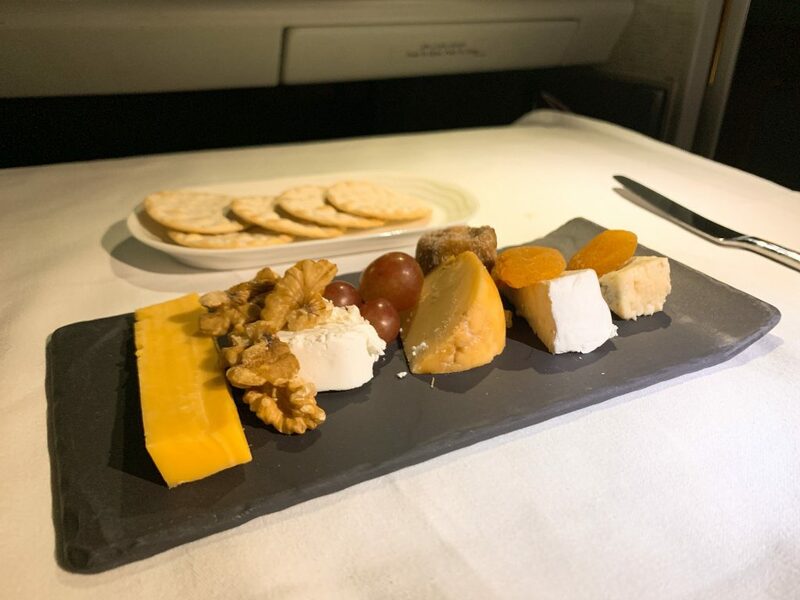 This time the captain also quietly thanked me for being such lovely customers…… it makes you wonder how many people flying in F treat stewards and stewardesses as skivvies! I have witnessed many people being incredibly rude to crew which is unacceptable. If you are polite and friendly it goes a long way. Doesn’t always work. Roving Reporter is charm personified generally and has had some terrible service in F.
I’m sorry to hear that the chauffeur and the service was inappropriate. I had a question, having booked a similar fare with a return in Istanbul: did you simply just not show up for the IST leg or did you process a cancellation with EK? What happened in either scenario? My return is not until April. 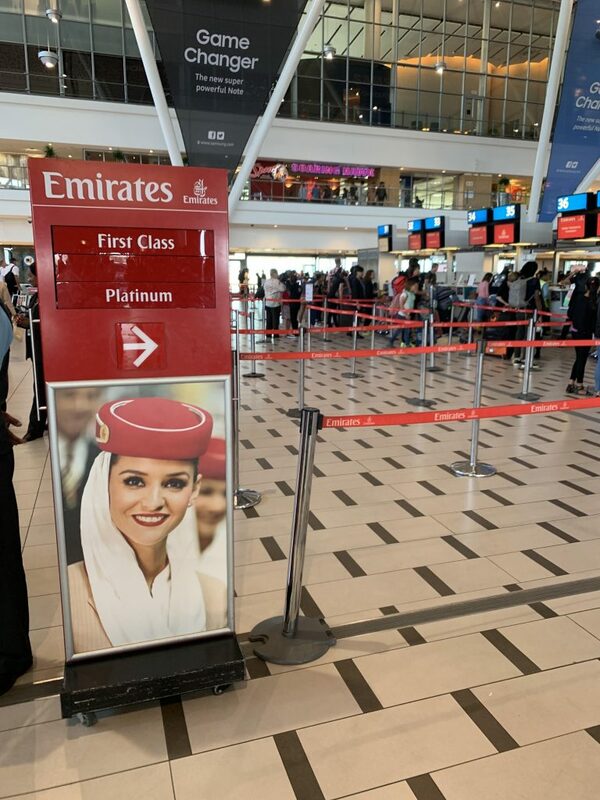 If you don’t fly the last leg you risk that Emirates could reprice the whole itinerary. I have never heard of them doing so but technically they could. If you were considering not flying the last leg I would not cancel it in case they tried to do so. Do you intend to fly the last leg from Istanbul, then? Was the 20,000 miles for the cabin service or the more sensitive issue? I don’t understand. Excellent report and a great read, well put together. Thanks Michael. Unfortunately IFE failures happen on every airline though you were unfortunate you had it twice in 3 trips. I always take my own content on a laptop or iPad just in case. Though I have been lucky that all my failures have been fixed after a reset. Normally my issue is that I fly so much I have already seen all the good stuff! Am I being silly here? You pictured a Mercedes but you said it was a new BMW 3 series?